Expands the built-in memory. You can now move downloaded games and apps to a USB memory device or HDD as an extended memory. "TV SideView" application name changed to "Video & TV SideView"
Only for use with TV sold in Asia Pacific. Not all models are sold in all countries. Press the [HELP] button on the remote. The model and software version should be displayed on the top right-hand corner of the screen. If the version number is "PKG5.433.xxxx" or higher, you already have the most recent software version and updating is not required. Sony provides software updates in order to enhance functionalities and provide users with the latest TV experience. The easiest way to receive software updates is by downloading directly from your TV via the Internet. IMPORTANT: The following "System Requirements," "File Info," "Download" and "Install," sections relate to the USB storage device update procedure. You can ignore them if you completed the update using the “Automatic software download” feature. For other FAQs about Troubleshooting, please see the "Questions and Answers" section on the Sony Support Site. You can also update the software by using a USB storage device. If you are not connected to the Internet, or the "Automatic software download" function fails to download, try to download and update using a USB storage device as instructed below. Do not turn the off TV - or disconnect it from the power - while it's updating. Verify that the size of the "sony_tvupdate_2015_5433_pab_auth.zip" file is "1 640 632 828" bytes. After you extracted the downloaded file, you will find the file "sony_dtv0FA50A09A0A9_00014200_153900b7.pkg". 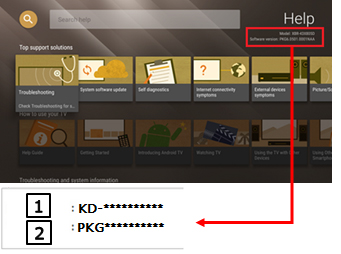 Copy or drag and drop the file "sony_dtv0FA50A09A0A9_00014200_153900b7.pkg" to the root directory of your USB device. Insert your USB storage device containing the file "sony_dtv0FA50A09A0A9_00014200_153900b7.pkg" into a USB port of the TV set. NOTE: Any USB slot can be used if the TV has multiple USB ports. Once the USB storage device has been detected, a series of different messages will appear on the TV set. Follow the on-screen instructions. NOTE： If the messages do not appear automatically, try turning the TV off and on with the remote control. When the file is finished copying from the USB storage device, the update process will begin, the POWER indicator on the TV will begin flashing white, and the update progress screen is displayed on the TV. When the software update is complete, a message appears on the TV indicating the software update is complete. Carefully remove the USB device from the USB slot. If the version number is "PKG5.433.xxxx" or higher, the software update was successful. If the version number isn't "PKG5.433.xxxx" or higher, download and install the update again. No. To ensure that your TV remains at optimum performance, the installation of an older software version is not possible. The latest software version contains all the benefits and improvements of previous versions. What to do if you have problems updating your TV firmware using the Internet.